Anverso El retrato de Elizabeth II de Ian Rank-Broadley seguido por el país de emisión y la denominación de 100 dólares. Reverso Una serpiente lista para atacar a su presa con el carácter chino para "serpiente" seguido del año, el peso y la pureza de la moneda. El retrato de Elizabeth II de Ian Rank-Broadley seguido por el país de emisión y la denominación de 100 dólares. Una serpiente lista para atacar a su presa con el carácter chino para "serpiente" seguido del año, el peso y la pureza de la moneda. 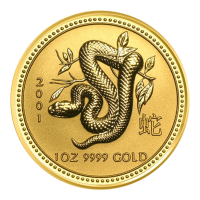 Moneda de Oro Año Lunar de la Serpiente 2001 de 1 oz de la Casa de la Moneda de Perth Enjoy the web’s lowest price when you purchase your 2001 1 oz Gold Snake from our online store today. These bespoke offerings from the Perth Mint celebrate the year of the snake in the Chinese Lunar calendar. The reverse depicts a coiling tree snake in meticulous detail, with every scale shown in high relief. The feature is surrounded by a delicate line and dotted frame, with the rough textured rear field bearing details of issue year, metal content, weight and purity. The obverse feature is a meticulous portrait of Elizabeth II In profile, shown in her Girls of Great Britain tiara. This immaculate portrait is encapsulated in a dotted border, along with Elizabeth II’s name, the country of origin and the coin’s unique denominational value. Those born under the year of the snake, in 1917, 1929, 1941, 1953, 1965, 1977, 1989, 2001 and 2013, are graceful, sympathetic and passionate intellectuals. Celebrate the rich symbolism of the Chinese zodiacal calendar and fortify your holdings with a 2001 1 oz Gold Snake today.